H.P. Lovecraft was a great horror, fantasy and science fiction writer of the early 20th century. Like many writers, he led a fairly tortuous and difficult life, and like many, wasn't as well recognized as the great author he was until after his death. 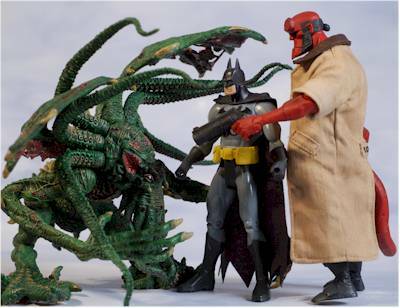 Many of his works were actually drawn from his own nightmares, and so it's appropriate that SOTA has titled the line of action figures based on his works as The Nightmares of Lovecraft. He is best known for his creation of the concept of the Necronomicon. This fictional book of dark magic has since been used and mentioned repeatedly in other works from the Simpsons to the Evil Dead. It was late in his career that he created the Necronomicon (also called the Book of the Dead) and the beings that it's writers worshiped, Cthulu and Yog-Sothoth. These were Gods of a sort, cosmic and universal in nature. 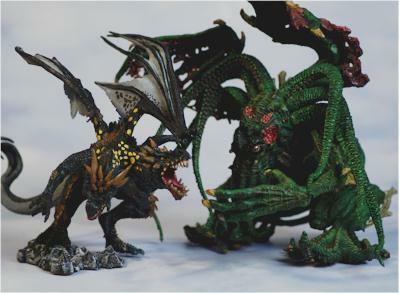 SOTA has produced three figures from some of the best known stories of Lovecraft - Cthulu (The Call of Cthulu), The Ghoul (Pickman's Model), and Dagon (Dagon). There's also a variant on Cthulu, done up in black instead of the standard green, which is a Diamond exclusive. I'm reviewing just the Ghoul and Cthulu here, and I'll cover Dagon and the varaint Cthulu at QSE later this week. The packages have some big pluses, but some other minuses even things out. One of the big pluses is that they are 'collector friendly'. Open them up, and the figure is sandwiched between two plastic trays. No twisties, nothing to damage, easy to get out and just as easy to put back. Another plus is the text on the front, using Lovecraft's own words to describe the beastie. The graphics are solid as well, emoting his style of prose. However, you can't see the monster particularly well within the box. The window wraps around top to side, but it's still tough to get a good visual on just what you're getting. 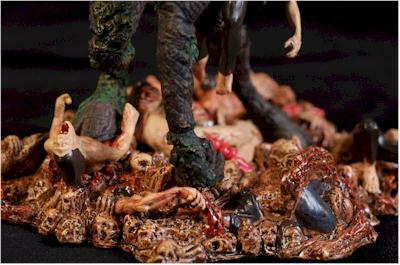 You know, when SOTA announced they were doing a Ghoul figure, I was really excited. How cool would it be to have a figure of Ron Sweed all dressed up in his goatee and funky hat, flushing poor Froggy down the toilet? For the folks from Detroit and Cleveland, that makes perfect sense. Everyone else can just assume I've lost my mind. 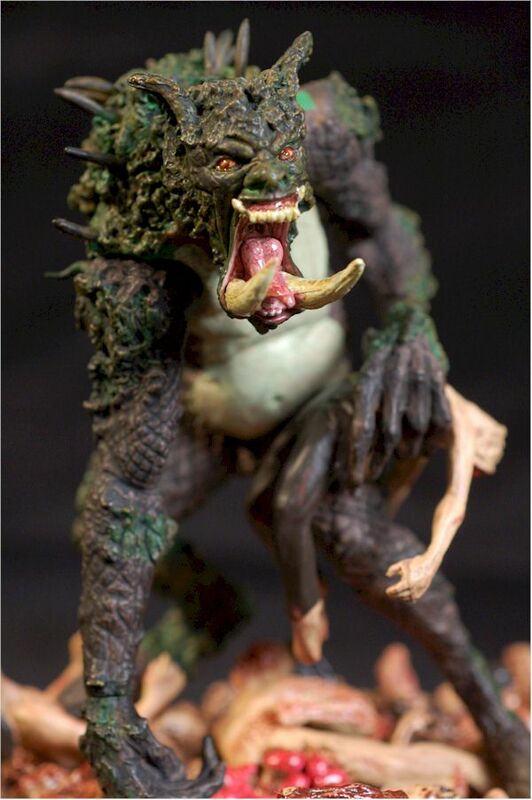 But it wasn't that Ghoul, but rather the one from Pickman's Model, the creature Pickman was painting when his friend figured out that it wasn't imaginary characters that Pickman was painting, but rather something real. 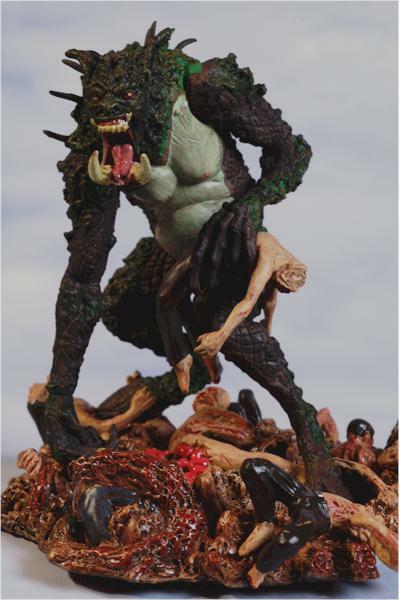 The Ghoul is pretty much rendered as described in the books, a Hell beast of sorts with massive fangs, gripping in one hand what's left of a man, trampling the bodies of others. The sculpt is much more detailed than the paint belies, with some great texturing of his skin, and excellent work around the teeth eyes and tongue. Scale will be the biggest issue for most folks on this character. Measuring only 5 inches tall without the base, next to most 6" scaled figures he looks like a big dog. He's a beast that really needs treatment at about twice this size. Cthulu's sculpt has even greater detail, with plenty of wrinkles, warts, and suckers. Again, the paint doesn't quite do this sculpt justice, hiding much of the detail rather than bringing it out. It's there though, and I was very pleasantly surprised with him after having seen the photos online. 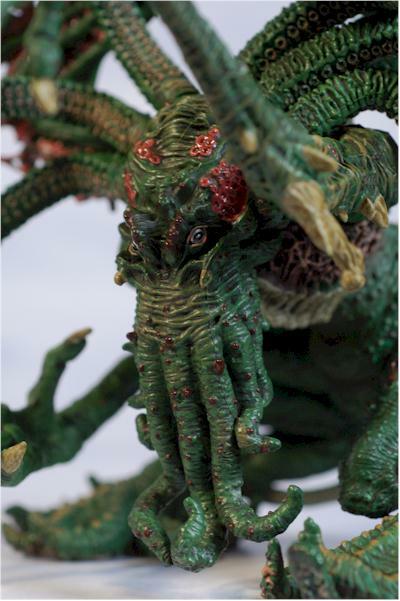 Scale is still an issue for Cthulu though, who was described in the book in terms of huge proportions. Here he's just about 8 inches tall, even out at the top of the wings. He'd be impressive displayed with figures in the 2" range, but if you plan on putting him with the Movie Maniacs/Cult Classics/Now Playing guys, he's going to come up somewhat short. 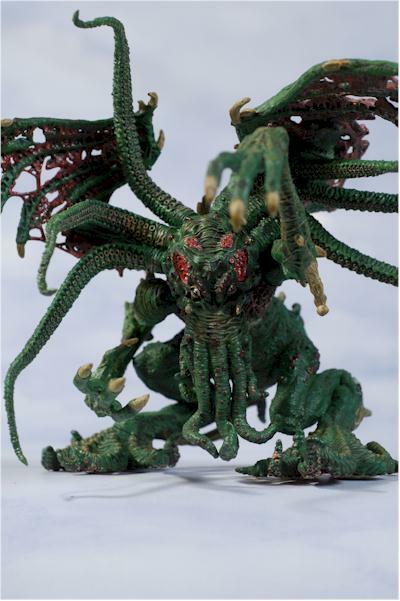 Cthulu stands great on his own, with his huge bulbous feet, but you'll need to use the stand with the Ghoul, who was designed and sculpted specifically for it. Both figures have one other issue worth noting - obvious mold lines. This was particularly true on the faces of both, where mold lines run through the fangs of the Ghoul and the mouth tentacles of Cthulu, breaking the smooth flow. These are specialty market figures, commanding specialty market prices. Unfortunately, it looks like the paint didn't quite make it up to specialty market expectations. However, it's important to note that these didn't turn out as bad as some had predicted based on recent photos. They aren't the works of art that the prototypes were, but that's not really a surprise. They aren't hunks of crap either, falling more into the arena of mass market work. Of the two, clearly Cthulu is superior. He has a greater number of paint operations, and more detail work in his complex skin textures. While he's predominately green, there's enough use of red and other colors on the details to give him some pop on the shelf. Sure, some of these details have a bit of slop in them, but he's far from the atrocity I was actually expecting based on early photos. Ghoul isn't quite as good, largely due to less complexity. His dark brown skin has some use of dry brushing to bring out the detail, but it's not enough to really give him much character. He's largely brown with a white belly, with little of the sculpt detail highlighted by the paint. His mouth work is the best of his applications, with a nice glossy wet looking tongue, and disgusting fangs and teeth. The base also has a nice mix of glossy wet looking bloody sections, and matte skin. Considering the price point on these guys - close to $20 at most retailers - you're really going to be expecting top of the line paint. Instead, the work here reminds me of good quality mass market stuff, decent enough but not the quality I was hoping for. 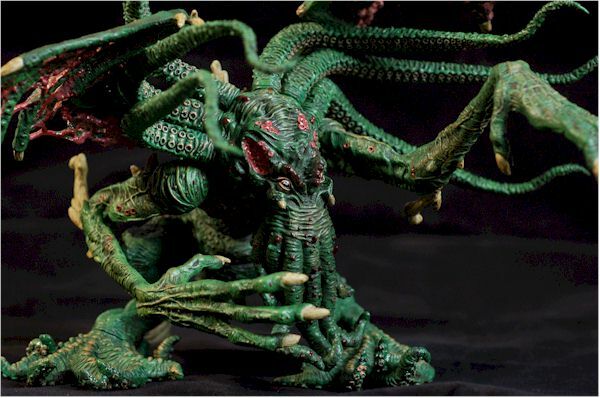 Considering the rather complex design of Cthulu's sculpt, I was surprised by his articulation. He has ball jointed wings where they join the back, a ball jointed neck (restricted a bit by the wings and tentacles, but not as much as you might expect), ball jointed shoulders, cut wrists, and of course, bendy tentacles. It's those bendy tentacles, which work quite well, that pushed him up from three stars to three and a half. He could have benefited by some sort of cut joints on the arms, but other than that, there's really little else more that he could have been given. The Ghoul doesn't get as lucky, and is a highly static figure. He does have a ball jointed neck and ball jointed shoulders, but the range of movement is highly restricted, and he really only looks good in a couple poses. There's also cut wrists, which helps in getting the human body into his left hand. Cthulu comes with zippo, although I'm not sure that accessories really make sense in his case. My little mind can't come up with anything fitting, but the more creative of you can probably come up with a good example of an appropriate accessory. The Ghoul has two really - the base of course, and the human he holds in his left hand. The base is littered with the decomposing and tortured remains of other people, including one poor unfortunate who's being trampled on this very moment by the right foot of the Ghoul. While the general gruesomeness of the base gets high marks, it was done in a rather soft, oozing style, with less detail to the individual parts. The same is true for the man. He fits nicely in the Ghoul's hand, and appears to have lost the top of his head. The Ghoul and Sylar appear to have something in common. With the litter of human wreckage on the base, and the lack of much poseability, the Ghoul doesn't make for a particularly good toy. However, Cthulu has both playability AND a nice, general monster appearance, making him useful fodder for games of good and evil. At around $13 - $15, these would be an average value. But at $18 - $20, they're on the expensive side, considering the scale and lack of accessories. If you're picking them out on the shelf, you'll want to do what you can to choose the best paint job, but other than that normal warning, there's not much else to worry about. 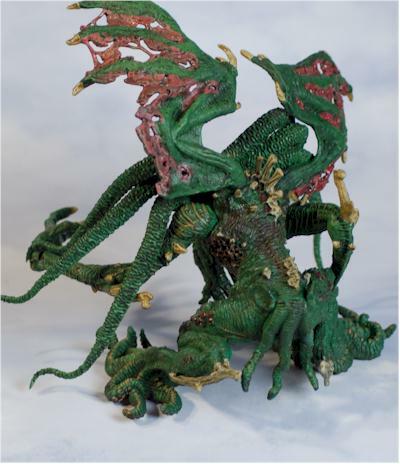 While Cthulu isn't quite as amazing as some of SOTA's other work, he is quite a bit better than I had expected. Early photos really didn't do him justice, and while the scale is a little small, he still makes a pretty impressive figure on the shelf. Remember, McToys Dragons are certainly not in scale with anything else, and they do pretty well. Cthulu is in a similar scale in my mind. Ghoul is hurt by a number of factors, including his small size and high price tag. Of the set of four (if you include the black variant Cthulu), he'll be the one to skip. 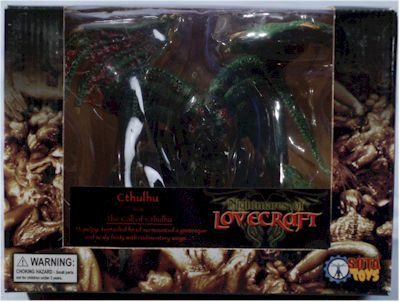 Diehard Lovecraft fans may still want to pick him up, considering how cool that particular story is, but the casual buyer will be much more drawn to Dagon and Cthulu. 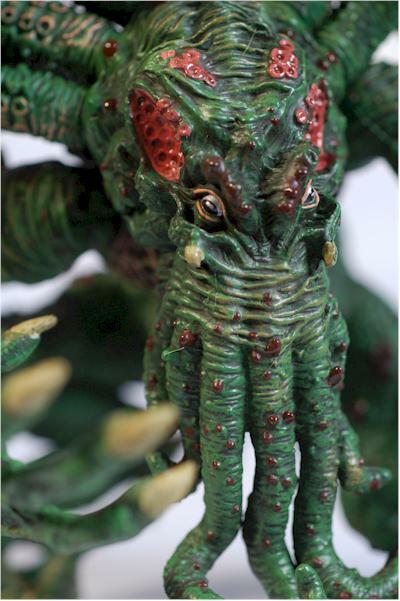 - YouBuyNow has the regular Cthulu for $19. - Amazing Toyz has the singles for $17, or the set of three for $52. 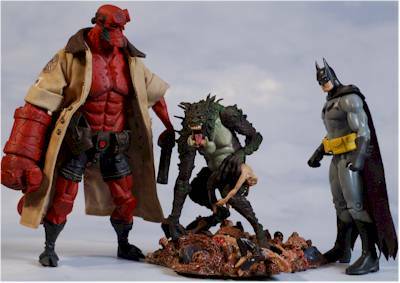 - CornerStoreComics has the individual figures for $18.50 each, or the set of three for $54. If you're looking for more information on H.P. Lovecraft, check out the Archive, where you'll find all kinds of nifty info and links.